Samsung and Apple managed to grow their smartphone shipments in Q2 2013, by 55 percent and 20 percent respectively to maintain first and second place. Nevertheless, they both lost share to Chinese vendors. 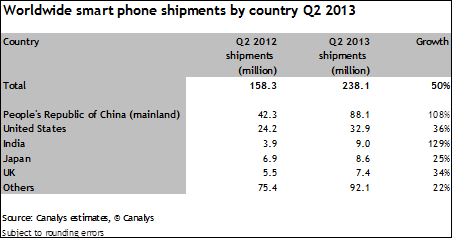 The latest figures come from Canalys, an independent analyst firm which estimates some 238.1 million smartphones shipped in Q2 2013. Compared to Q2 2013, this represents a 50 percent year-over-year increase. The five Chinese vendors shipping the most devices worldwide (Lenovo, Yulong, Huawei, ZTE, and Xiaomi) made up 20 percent of the total market, up from less than 15 percent a year ago. 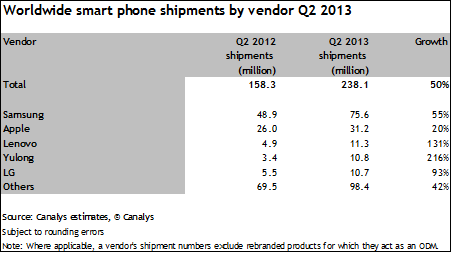 Rounding out the top five vendors were Lenovo, Yulong, and LG. As you can see, Samsung is of course the biggest winner here as it not only managed to stay in first, but grow its lead ahead of second place. Apple’s market share meanwhile fell to its lowest level since Q1 2009, although its overall numbers managed to keep up performance thanks to older models that received price cuts. Shipments in China grew 108 percent year-over-year to 88.1 million, representing over a third of all worldwide shipments. Lenovo took second place in China this quarter, and because 95 percent of its total 11.3 million shipments were in its home market, it managed to take third place in the worldwide smartphone market for the first time. 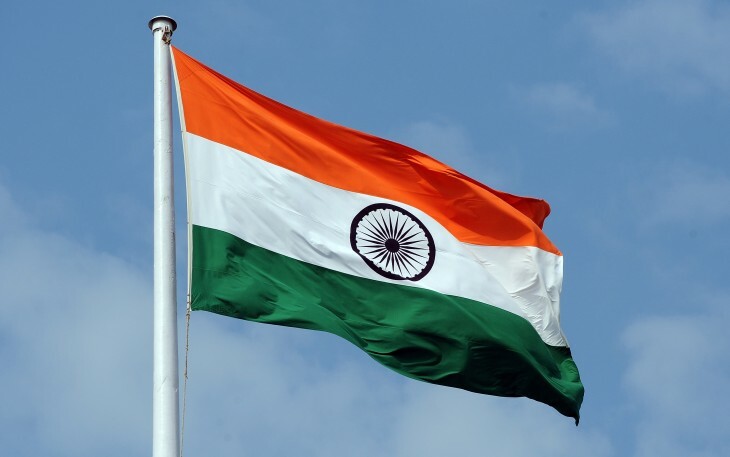 While the US was in second place in terms of shipments, India managed to snag third place thanks to the fastest smartphone shipment growth of the major markets: 129 percent to hit 9.0 million. The only international vendor to really succeed in India was Samsung, according to Canalys. Lastly and unsurprisingly, Android grew the fastest during the quarter, up 79 percent year-over-year. It powered 190 million (or 80 percent) smartphones that shipped in Q2. Apple’s iOS fell to 13 percent share. Windows Phone and BlackBerry retained 3 percent share each. Read next: Are you driven by making your investors rich?